Is this a new heyday for Russian River Vineyards? If you pay attention and have an aptitude for learning things over time, you may come to suspect that heydays are subjective. 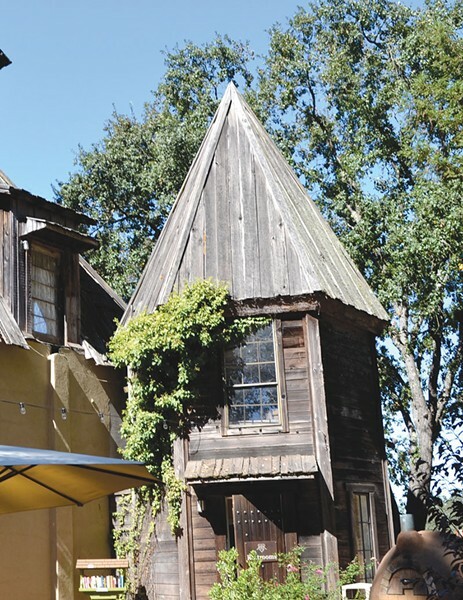 I'd always thought of the Topolos period of ownership as this iconic winery's heyday, when richly extracted Zinfandel and Alicante Bouschet flowed in the tasting room downstairs, and while diners enjoyed countless good memories in the restaurant above. Then again, this paper's review of that iteration of the restaurant—way back in 1996, kids!—found quality uneven, and the wines were sometimes controversial. The old tasting room, which old-timers may recall as being sensibly located in a corner of the ground floor by the gravel parking lot, was the kind of cluttered, unfussy hangout that sold comic postcards that mocked wine tasters, and a wine called Stu Pedasso, and was sorely missed when a new, gaudy and awkwardly placed bar was briefly opened upstairs. Each time I checked in on the joint, I found a new bar set-up, shunted to a different corner of the building. Yet this place, built in the late 1960s and so rustic that it's got actual bats living in the attic, rebuffs any attempts to fancify. On a recent visit, I was happy to find that the itinerant bar is now outdoors, attached to the former winery (which was styled to evoke both the area's historic hop kilns and the chapel at the Russian colony at Fort Ross), and that wine quality and service were pretty darn spot-on. Far enough removed from highway traffic, conversations in the garden seating area are only interrupted by the knock-knock of a woodpecker—an annoyance only to the colony of bats that tries to catch some sleep in the attic of the old winery loft—or, for feline fans, by the purposeful stride of a gray cat named Truffle. A floppy-eared dog, meanwhile, fails to keep up with its master as it pauses to gaze wistfully at a plate of appetizers that's been set before a couple nearby. Little wonder: the mussels swimming in buttery saffron sauce ($18) are eminently edible, the cheese plate is pricey but not same-old ($22), and the requisite shishito peppers ($12) spice up wines like the savory, sinewy 2014 Two Pisces Vineyard Sonoma Coast Pinot Noir ($65). Is it a heyday at Russian River Vineyards? Hey, it's a new day—and for right now, it's a pretty good day. Russian River Vineyards, 5700 Hwy. 116 N., Forestville. Open daily, noon–8pm. Tasting fee, $20. 707.887.3344.